Hey guys. Finally getting back to restoring the roadster pickup. I've got some assembly problems. I had to buy a new seat frame and floorboard risers, but I'm not sure exactly where to nail them down. Does anybody know the angle of the floorboard or the seat frame once they're assembled? I'm having trouble figuring out exactly where I should put the screws. Any help you guys can give would be great. Thanks again! The year of the vehicle you are working on would help and maybe even a photo of the area of concern. Right. Sorry about that. It's a 1923. I'm wondering the angle of the front two floorboards in relationship to the one closest to the seat frame. The angle of the seat is how low the rear of the seat cushion should be in relationship to the front. I will try to get pictures ASAP. 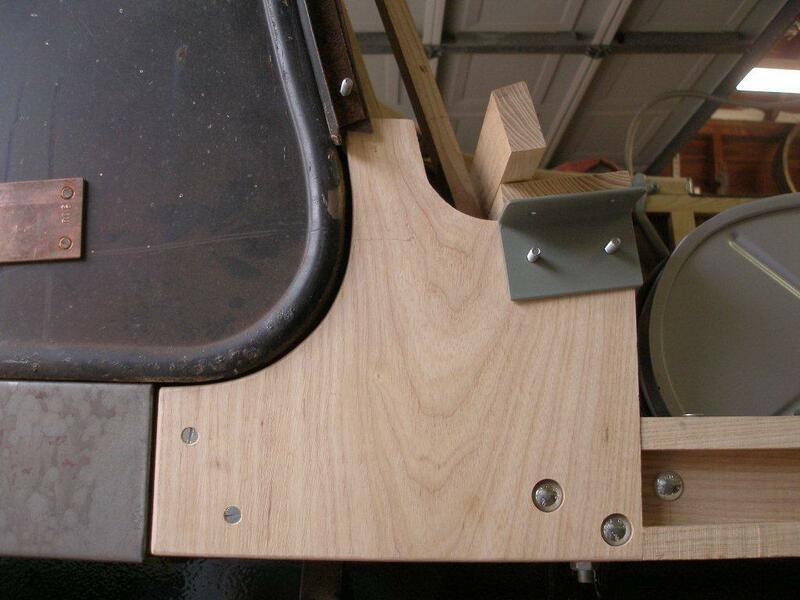 From the little bit you posted in this thread it sounds like you are rebuilding and that would normally mean rebuilding a roadster body that you plan to put a pickup bed instead of using the rear turtle deck. If that is the case, I would highly recommend you obtain a copy of Leon Parker�s excellent rewooding plans and related instruction for the year and body style of your body. He has them for the open cars 1913 to 1927 for both the runabouts (often called roadsters by many of today�s hobbyist) as well as tourings. You can e-mail him via the Private Message feature of the MTFCA website see his profile at: http://www.mtfca.com/cgi-bin/discus/board-profile.cgi?action=view_profile&profile=leon_parker-users and click on the Send Private Message. His e-mail address is: ford1914@bellsouth.net Customer comment at: http://www.mtfca.com/discus/messages/179374/198934.html?1300828585 From memory -- not as good as it once was -- I do not think Leon's plans show the angle of the floor board risers, but rather the locations of where to place the wood [or for some bodies metal floor board risers] that will result in the correct angle. If you have been around Ts and understand the difference between a 1923 model year and a 1924 model year that was produced in calendar year 1923 � feel free to skip the next part. Because Ford USA introduced the 1924 high cowl touring and roadster bodies on/about Jul 1923, many of them were sold and registered as 1923 cars. 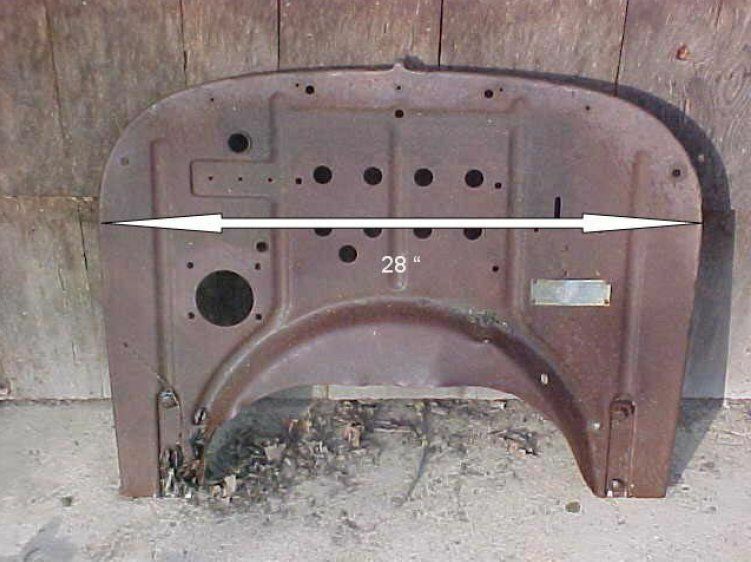 Ford referred to them as 1924 model year cars and while the chassis parts are virtually identical between a 1923 model year car produced in Jun 1923 and a 1924 model year car produced in Aug 1923 many of the sheet metal parts are different � including the wood kit for those cars. 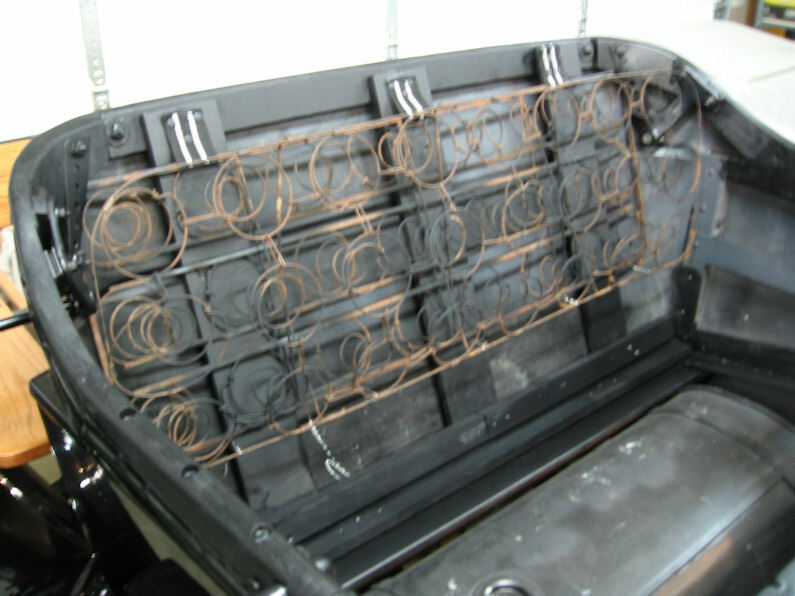 Specifically the high radiator, high cowl was introduced and was the beginning of the 1924 model year cars. Check the firewall width (Thank you Phil Mino for the excellent photos!!! Which have been reposted by many of us over the years). Above a metal low cowl firewall which is 24 3/8 inches wide (they were wood most of the years � but same width and height 1917-1923). Above the 1924-25 metal cowl which is 28 inches wide. 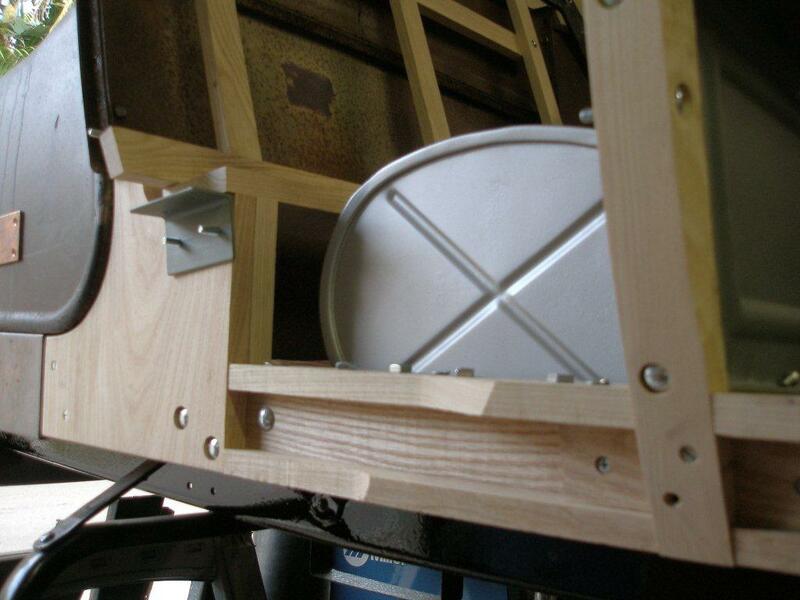 Note also the tall reinforcement ridges on the sides where the firewall to frame brackets mount. In the photo above the 1924-25 cowl is on top and the 1917-1923 size cowl is on the bottom (some holes may have changed over time. 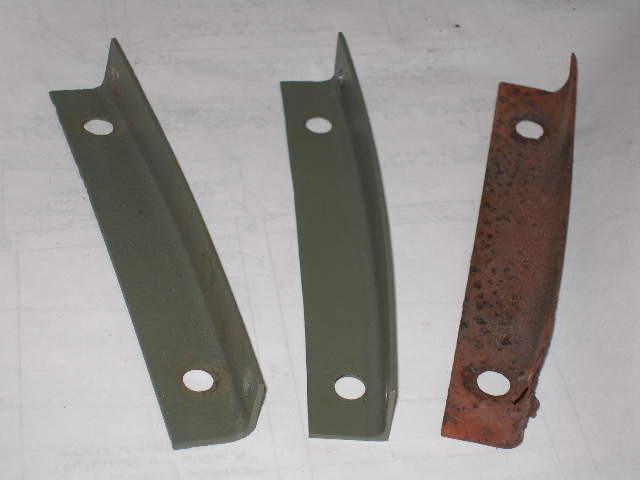 The 1915-1916 cowl is the same size and can interchange but it does not have the half-moon cut out for the radiator rod). If you or anyone else would like a free copy of RV Anderson�s article �Rewooding a Low Cowl 1923 Roadster� please send me an e-mail with your address and I will send you the article from the �Vintage Ford.� The club allows us to share those for non-profit use to promote the club and hobby. Also be advised that folks sometimes have mixed parts from various years. In some cases they work great -- such as the 1917-23 open car cowl fits any 1917-23 open car (it won't work well on the Centerdoor). 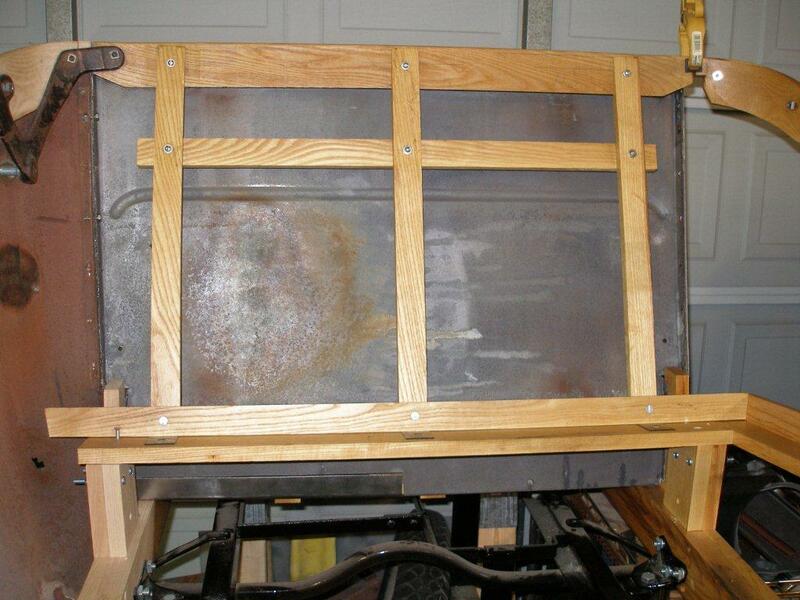 But a 1924-25 side panel with the fake door will NOT fit nicely on a 1915-23 low cowl car. So if the parts are in a pile it can get confusing. 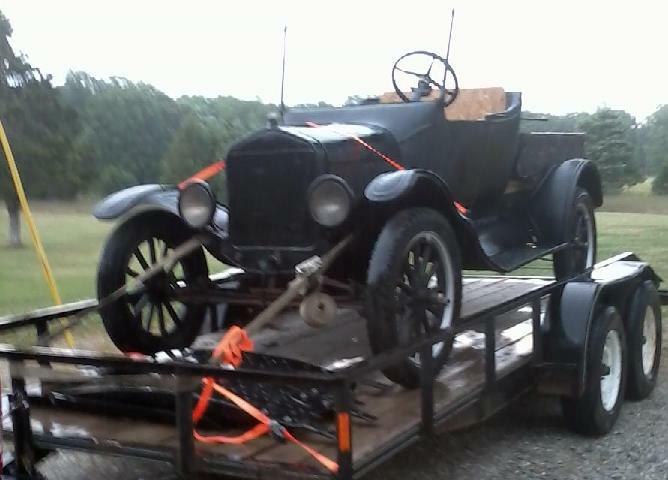 And to confuse things a little more, any 1909-1925 body can be put on any 1909-1925 frame with a few modifications to the chassis [use the correct hood, radiator, fan, body brackets, gas tank, steering column for the ones that used a different column, move running board bracket for 1911 torpedo etc.] Please confirm that you are wanting information on the low cowl version of the body. That it is a runabout/roadster and not a cut off touring (front floor would be the same but some other things would not). Thanks Hap. As always, your knowledge overwhelms me. I need to cut the front pillar in order to mount the floorboard supports in the right place. Is this normal? I've never had to put these in before. When I bought the car everything was built out of plywood, so I'm trying to fix it. How tall does the rear of the seat riser need to be? I purchased a new riser from Howell's a while back (also made of plywood when I bought it) and I'm unsure how to mount it in the car. Anybody who's done this kind of work would be a tremendous help for me. Thanks again! Sorry for the thread bump, but I'm really stuck on this step. Maybe there is a similar car close to Hamilton, Il you can go and have a good look at & get some measurements? I'm not actually in Hamilton. I'm going to school in McPherson, KS. The car is here with me, as a way to keep me out of the bars when I'm not in class. Everybody around here that I know has T's either has brass-era cars or improved cars, which would be different. I'm trying to find how tall the rear needs to be. I have the front panel installed in the correct position, but nothing is attached. Is the seat cushion supposed to be parallel to the frame rails? I was thinking there should be a bit of angle to it, but I'm not sure where it should be. Perhaps this thread will be of some help? Mark, It is a little bit. Mine is a steel frame, but from the look of it the seat cushion sits very very close to the gas tank in the rear. Should I try to mount the rear of the seat cushion as low as I can without actually resting on the gas tank? Or does it need raised? In the picture my springs are sitting directly on the gas tank, and that look pretty low to me. On my 1923 touring/pickup, the seat springs sat so close to the gas tank in the rear that you could see witness marks on the tank where some rubbing was taking place. I wasn't comfortable with that, so when I built the wood structure to support the seat back I raised the rear of the seat 3/8 inch with a wood spacer. Maybe not perfectly original, but it works for me. Jared, there is supposed to be a frame with panels at each end of the front and rear riser. 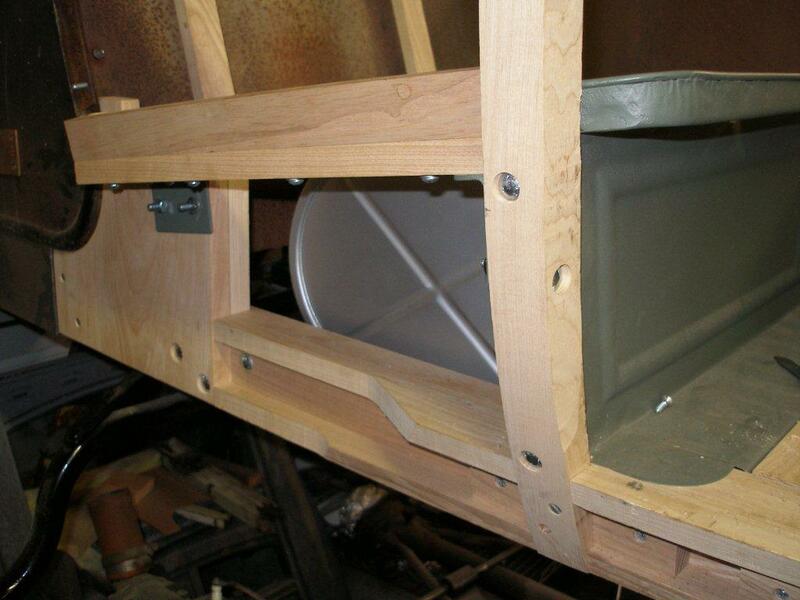 If they are installed correctly and the tanks is the correct one and it is installed with the correct mounts, the seat bottom will be somewhat parallel to the plane of the main T frames. 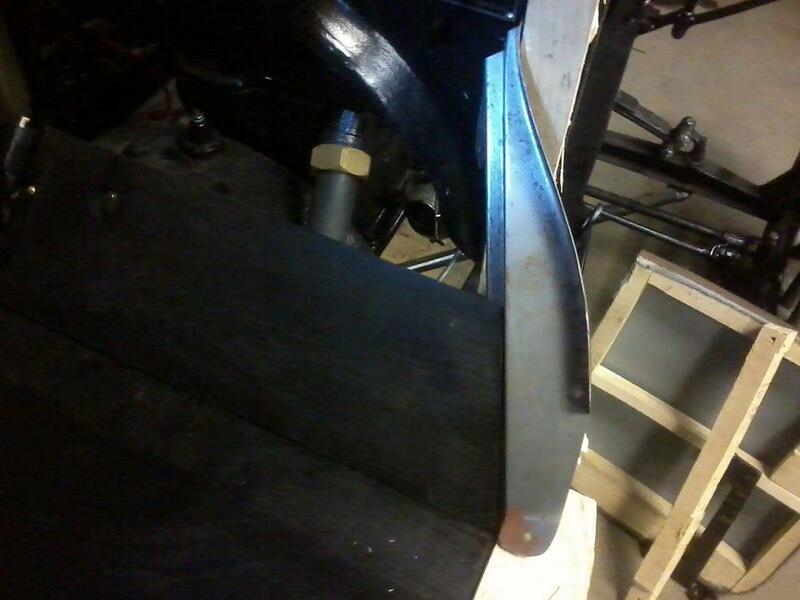 The top plane of the seat will have a very slight slope to it if it is properly stuffed. There will be a small gap between the tank and the cross member at the rear of the seat cushion's bottom. That crack will vary from car to car and model to model or so my experience has found them that way. I think I've got this figured out. I will put the covering on the seat springs, then mock up the frame so it's fairly parallel to the frame, then lower the back until there's a slight angle toward the back of the car. If anyone else has a more precise method, I'm willing to give it a shot. 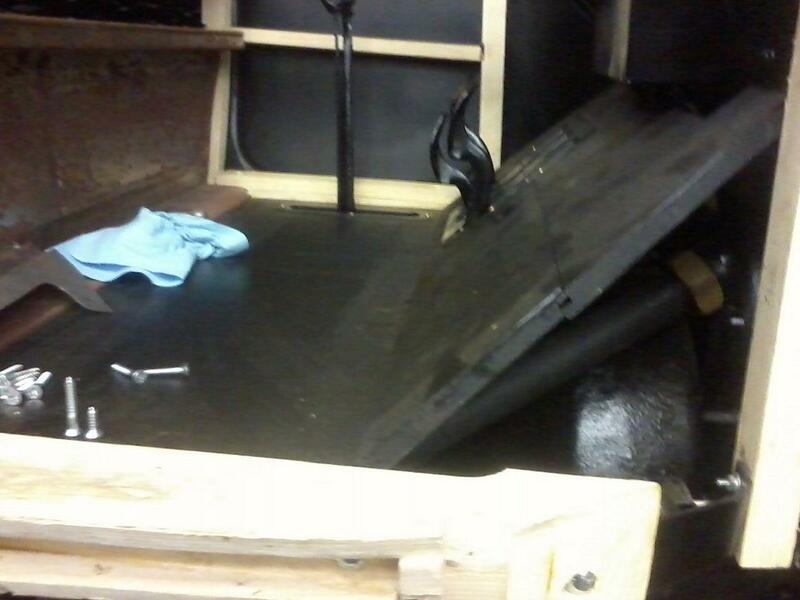 As for my floorboard issue: I think the floorboard needs to come down until the front touches the firewall. 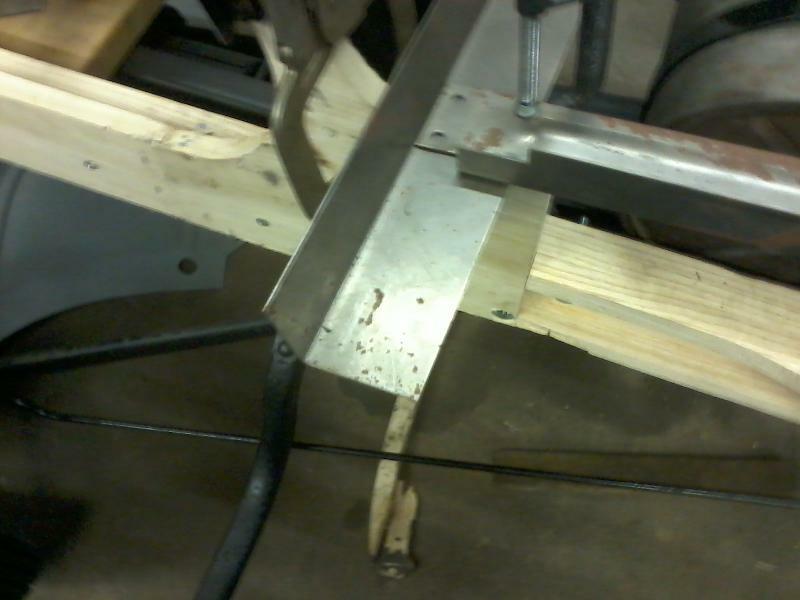 This involves cutting into the front upright pillars of the body to mount the support pieces. Is this right? I don't know exactly where these need to be mounted. 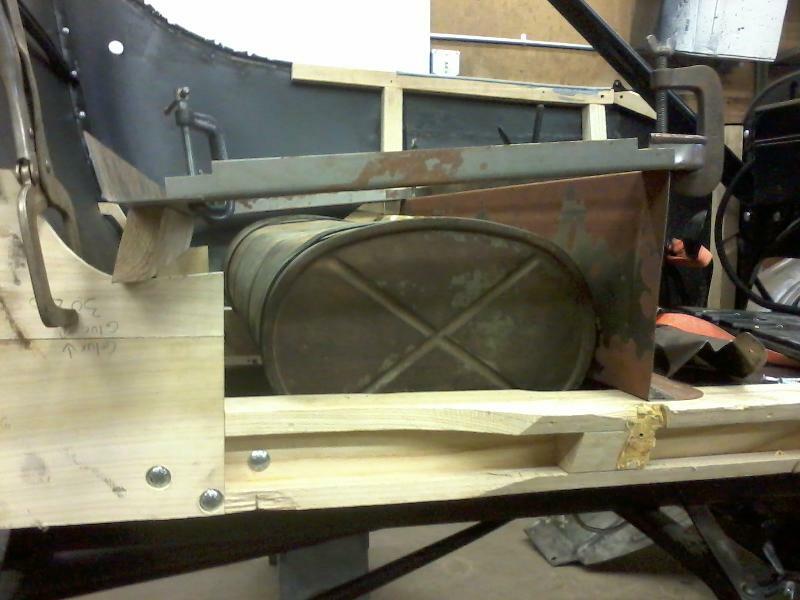 I've got the seat base all clamped together, now just looking to see if I have it put together correctly. Does this look right to you guys? I bought this frame from Howell's Sheet Metal at Chickasha last spring. Just now got the car ready to put it in, but I'm not sure I put it together right. Anybody else installed one of these? I'm also not sure if the board under the rear of the seat is correct. It's part of the kit I purchased from the Cubels at Fordwood.com Anybody know how this should be attached? I'm also wondering why the rear piece is so much longer than it needs to be. Should I cut it off? The seat springs I ordered from Lang's are square frame, so I attempted to clamp the sheet metal in the same configuration. Am I missing something here? Sorry about all the questions, but I'd rather put everything together the right way the first time. Thanks again, guys! I raised the back of the seat a little (about an inch)to keep the springs from laying on the gas tank as was original (believe it or not). I think you have the back of your seat too high, as it is pcs. Scott � thank you so much for posting the detailed photos � they should be a big help. Would you also clarify if the photos you posted are for the low cowl or high cowl body? I could not see enough of the firewall to tell from the photos. I�ve read your thread several times and you are making good progress. I have not commented again, so far, because I have not been able to tell if you have a low cowl or a high cowl roadster body. I�m a little slow, but I believe that would be a key item for me to be able to post information for the correct year range (i.e. 1915-1923 or 1924-1925). Others more familiar with the roadster bodies may have easily already seen one or more things that clearly identify it as falling in one group or the other. And technically a 1923 would be a low cowl but many folks call a 1924 model year car that was produced in 1923 a 1923. And then there is always a chance that you have already clearly stated that and I missed it. I would say it is my hearing because I used to work around jets but since it is all typing � I�ll have to use the other excuse � my glasses may have been dirty. Another item that is an important factor in putting it back together correctly is � was it originally all together and you took it apart or have you collected the sheet metal from several bodies (many folks do that � especially if you find a body sitting on its side. The side that is off the ground will be in much better shape than the side that is in contact with the ground etc.) There were different height seat panels in the front based on the approximate year � there would have been some overlap when both the older style and the newer style were used etc. You already shared that much of the interior was done with plywood by a previous owner. 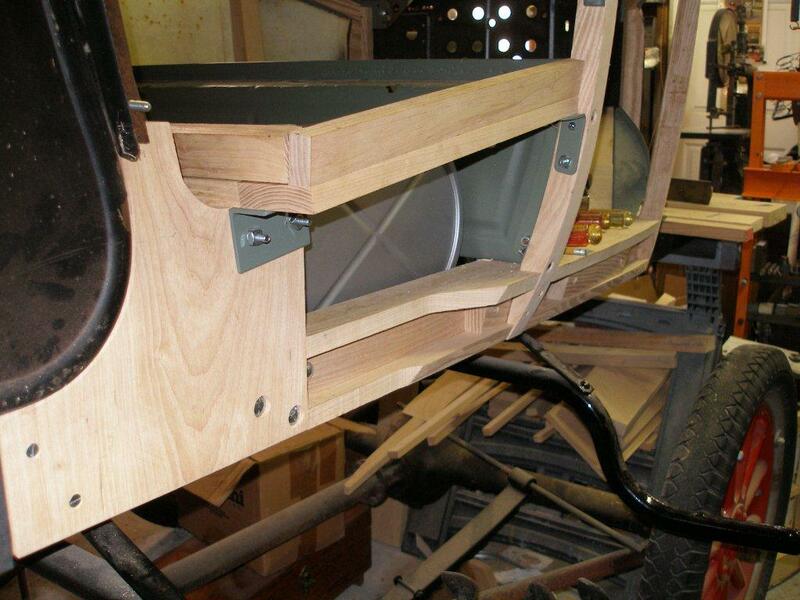 That you ordered the wood kit from Cubels at www.Fordwood.com and the seat frame and heel panel from Howell�s sheet metal. When you purchased the car � were the body panels still tack welded together or had the previous owner either already taken them apart or was he building the body up from panels from different cars? If you could answer (or answer again if that is the case) those two questions for me, that will let me know which direction to look � low cowl or high and if I need to look for miss matched panels. You also mentioned you are attending school in McPherson, KS. Are you enrolled in McPherson College? If so you should have access to really talented folks as they offer a degree in Auto Restoration ( see: http://www.mcpherson.edu/autorestoration/ ) You may already have your T parked in their project area and they are working with you on it, but I would think they would be an excellent resource for some of your questions as they have restored numerous cars over the years. By the way if you are in that program that is GREAT. If you are not in that program it is still GREAT that you are pursuing your education. It can open a lot of doors for you in the future. I�m sure you are going to have a great looking roadster when you are finished. And please put together some of your lessons learned to help those that come behind you to find their way when they are rewooding their car. it is a low cowl, steel firewall car. Thank you so much for clarifying the photos are from a 1923 low cowl roadster (and looking at some previous postings � they may be from when you rewooded your roadster). Do you have any indication which body maker produced your body? In your case it has a wooden seat frame. In the case of R.V. 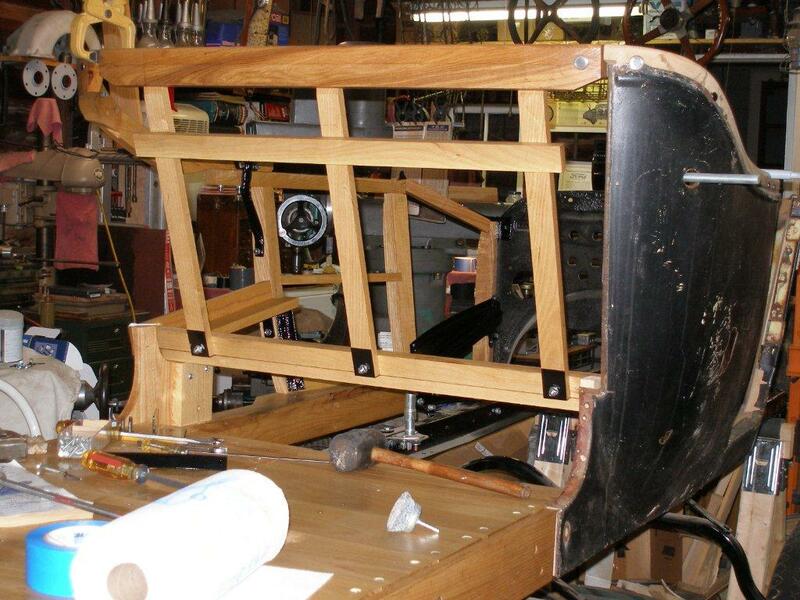 Anderson�s rewooding article of a 1923 low cowl, his body had metal seat frames on the side but they had wood attached so the upholstery could be tacked in place. I am wondering if there is any pattern to the roadster/runabout body having wood verses metal seat frames? If anyone would like a free copy of R.V. Anderson�s rewooding article � drop me an e-mail with �Send Model T Roadster rewooding article� or something similar in the title. You can click on my name and my e-mail address is the third line down. the wood was mostly mulch, with only scraps to give detail, so I'm sorry, I don't have any info on the body. 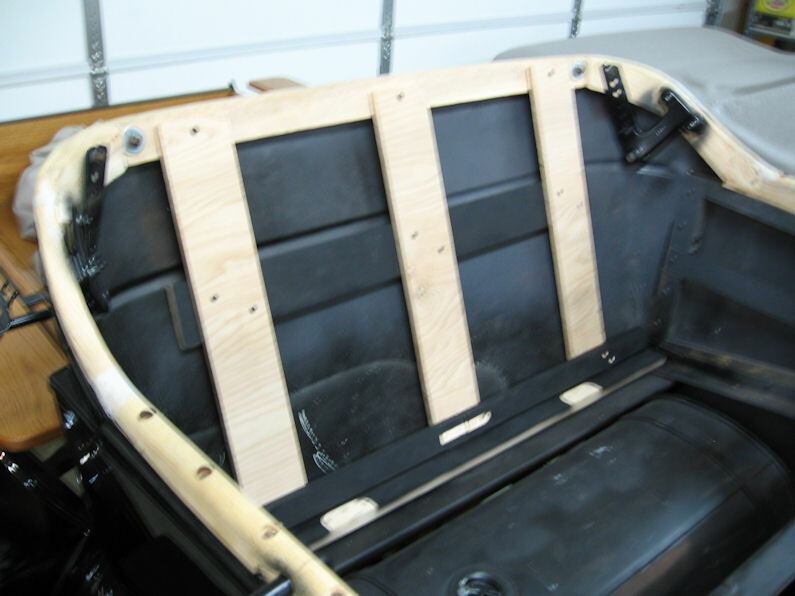 There was enough wood around the area in question to ensure that the sides of the seat frame are accurate and were held in place by the little "L" bracket at front, and angle plate at the rear...And yes, the pix are from my rewood project on the roadster. Sheet metal is on now, and everything seems to fit nicely. Just need to verify hood/radiator/body alignment and it will come off the frame. I am a student in the Automotive Restoration program. This is my personal project, in order to gain more experience. Here's a picture of the car the day I bought it. As far as I can tell the body isn't a mismatched pile of parts, but I'm no expert by any means. I didn't have any wood or interior pieces to go by when I got it, so I've been using drawings from Cubels and whatever information I can find on the forum in order to build the inside. I'm not exactly sure how to fit it all together, however. I believe my car is a high cowl, but I will remeasure it the next time I get a chance to get out to the garage. After all, studies come first. 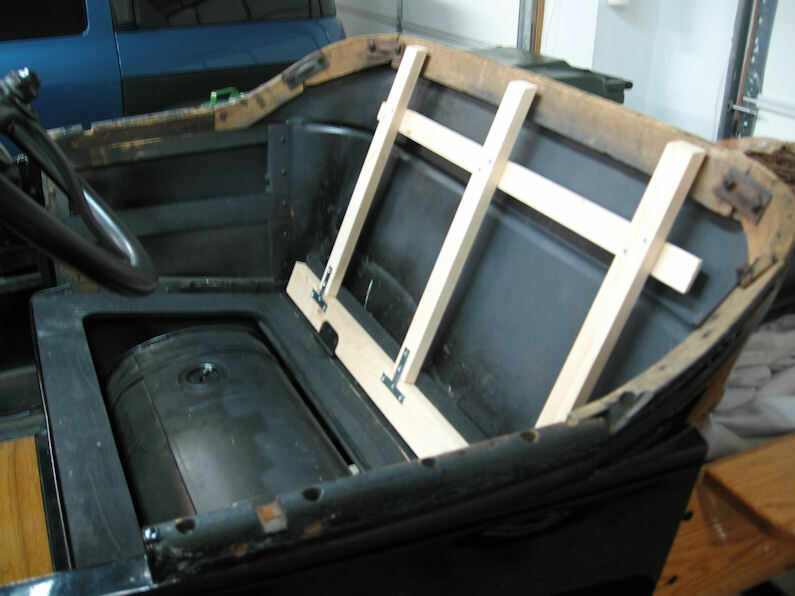 I'm going to suggest STRONGLY that you do what I did and back up the swoopy piece of wood that the back rail of the seat sits on and sets the curve for the trunk/bed. Take a look at my pictures and you'll see that it looks like a double thickness of wood and it is. 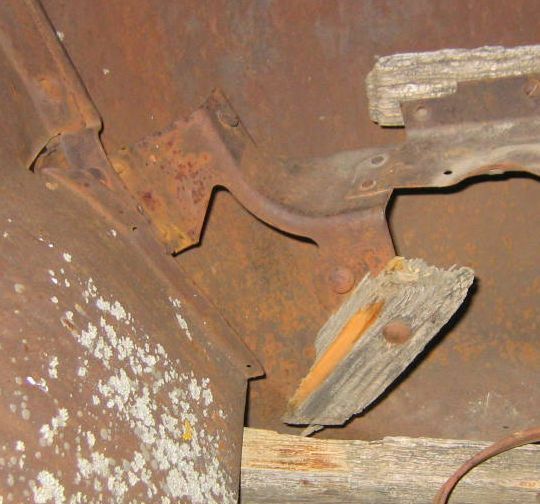 The reinforcing wood sits on TOP of the rail, while the original wood bolts THROUGH the rail. My reinforcement is belts/suspenders, but for you, I think it would be even more important. That area is going to take some stress and I fear for your use of two pieces with lap joints may not be up to the task, but it's an easy job to reinforce it. Thanks Scott. When you say reinforce the swoopy piece, do you mean like this red arrow is pointing to? I think I'm going to build a horizontal piece like the blue arrow is pointing to, in order to better support the sheet metal back and give it the proper angle. I appreciate your help, and everyone else on the forum whose helped me get my car back to nearly correct condition. I don't know how tall you are or how long your legs are, but be careful about adding a lot of thick structure beneath the seat bottom and behind the seat back - My first attempt on my 1923 touring/pickup was too thick and pushed me up too close to the steering wheel for comfort. I pulled it all out and redid it with an eye towards lowering the seat bottom and keeping the seat back as far back as possible - the second try came out much better, see attached pics. 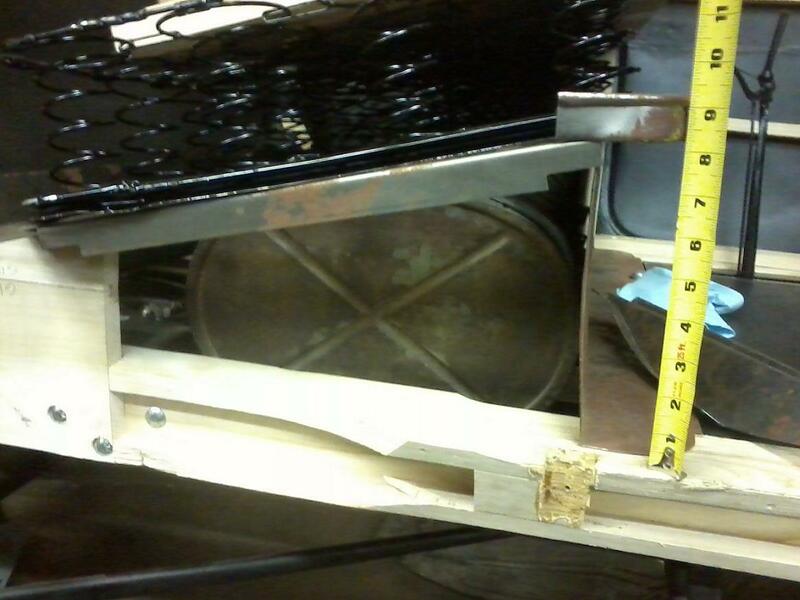 your interpretation is correct...and the horizontal piece is the nailer for the back springs. Those parts are definitely correct on my car, as that was one of the few parts that remained intact and could be duplicated without any guesswork. Also notice on Marks car how low the back of the seat is and how close the bottom spring will be to the tank. Thats how yours should be or you'll have clearance problems getting behind the wheel. I guess I need to find a happy medium? I'm also wondering about the proper construction of the sheet metal pieces. In one picture the sides of the frame are pointed down, in the other they're pointed up. Anybody have an opinion on this? I'm pretty sure they should go up to make sure the seat doesn't slide side to side, but it's much easier to move a c clamp than a plug weld. Thanks again! I think they would go up, and wood nailers would attach to them. You are missing a metal bracket that the rear of the seat frame is fastened to. I do not have the ability to post a photo of this ,but possibly some one else may know what I am referring to and can post a picture. I didn't know there was such a thing, but I would be interested in seeing some pictures. Thanks Jim. Scott, That's what I was thinking. There aren't any holes to nail them to the wood, though. I guess I'll have to drill some, once I find the proper mounting locations. Based on my 24 touring, you seem to be missing two brackets, one on each side that the heel panel fastens to. Also there is a piece of wood on each side that the seat rail side and upholstery attaches to. I assume that you have a late 23-24-25 body style. Find a club and someone near you who has a roadster like yours and go look at it. A picture is worth 1000 words, the real thing is worth at least 1500. You might call and visit Mark Freimiller in Iola, about a 2-1/2 hour drive? He should have all manner of roadsters in all stages of assembly disassembly and whatever. I have the wood pieces. They're just not attached yet. 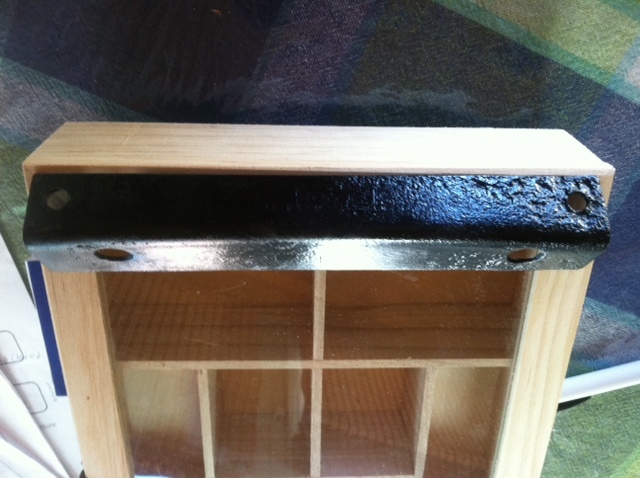 As for the heel panel brackets, I don't have any idea what I'm looking for. can someone post a picture? Are they something being reproduced? Still searching for these brackets. 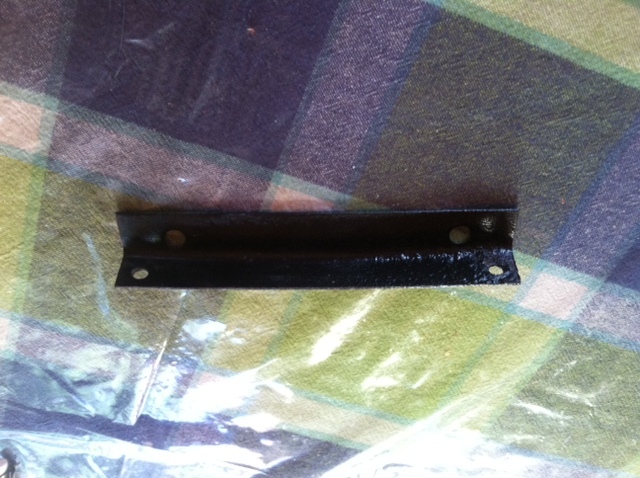 Does anyone have pictures of their seat frame with these brackets attached? They look like this. I have only found one extra in my pile, but you could probably make them. They are curved on one side to match the curve of the pillar wood. 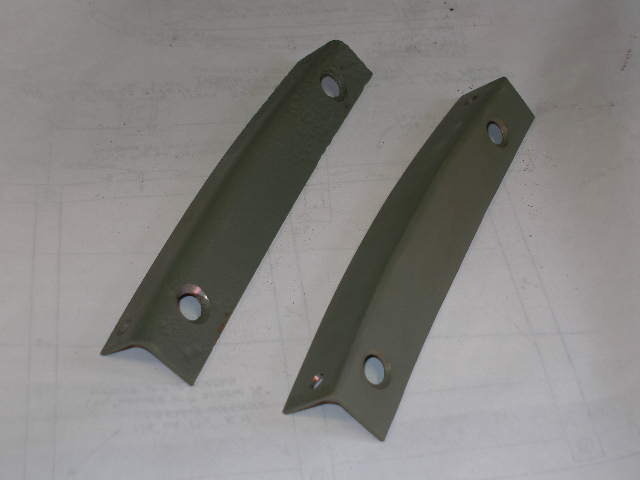 They are bolted onto the heel panel and are then bolted THROUGH the door pillars from the outside before the car is skinned. The bracket I mentioned is not the one pictured, the one I mentioned is on the rear of the seat frame and is fastened to the curved upright board where the body connects to the main sill. Jim....you are correct. You are referring to the brackets for the rear of the seat box. Jared specifically mentioned heel board brackets, which is why I posted them. The bracket that they are talking about was used on the 1925 roadsters. The 23-24's used an angle iron support bracket. I will look for some pictures of the 25 brackets. Does anyone have a picture of the 23-24 brackets? Maybe some measurements? Sounds like something I could easily make, if I knew exactly what I need and where it goes. Thanks guys! 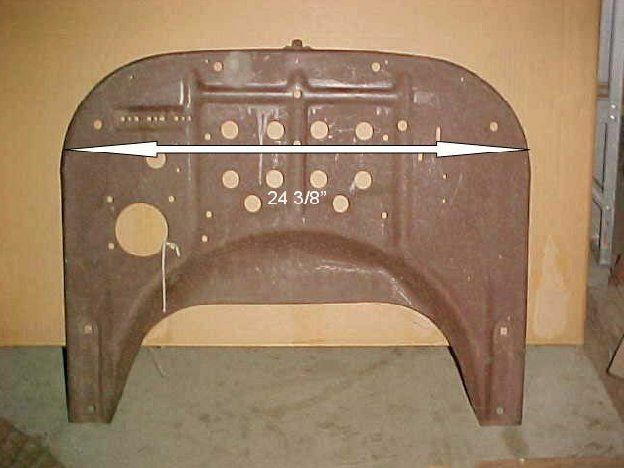 The 1923-24 rear seat brackets are just angle iron.Here is a picture of the 1925 rear seat bracket. So they mount against the pillars like this? That seems simple enough to make. Anybody know what gauge the metal should be? I realize now that it would have been easier to repair the original, but at least it was a good learning experience. 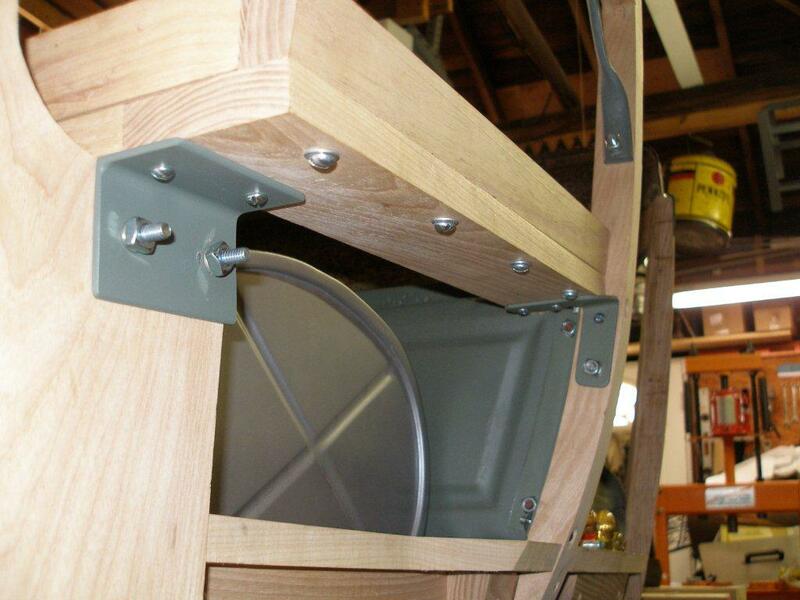 There isn't any countersink stamped into the heel panel. There isn't any hole yet, but I can easily drill a couple holes. What kind of fasteners should I use? As I recall, they are flathead 1/4 - 20 screws, with straight slot. When done, the flat heads are perfectly flush with the sheet metal...this means that some of the tapered head needs to go through the bracket and will need a 5/16" washer on the back side (overall height of head is greater than the sheetmetal and bracket, and that's why you see a countersink on the bracket itself as well). Note that the hole in the bracket is larger than 1/4" to accomodate the length of the head. I wish I could give you more info, but it's assembled now. Jared, this thread hasn't been updated in a while, how did things turn out? Mark, I actually just made up some new brackets today. I went digging in my pile of original wood scraps and found the proper bracket on one, so I had a pattern. Went to Tractor Supply and bought some angle iron, heated it up and bent it to approximately the right shape. Drilled holes for wood screws and 1/4 inch bolts. Got them painted with some black paint and drying right now. Almost ready to put in the car. Hopefully I'll have some time to get everything installed this coming week. I'll post pictures when I do.